Students are expected to conduct themselves in a manner that shows respect for all members of the school community, for the students’ own personal property, that of others and for the property of the school. The standard of behaviour must be socially acceptable, both inside and outside the school. We expect students to uphold the school values of respect, aspiration, excellence, collaboration, and responsibility at all times. • Mobile phones are to be switched off and out of sight at all times during the school day, including break and lunch times. • Students are not permitted to leave the campus during the school day unless permission has been requested from, or given by, the parents. Slightly different rules are in place for Year 13. • Any form of brawling, bullying, racism and bad language is unacceptable, and will be dealt with in a serious manner. • Chewing gum, smoking and stimulants are prohibited anywhere on the school All visitors to the school are asked to respect our no chewing gum rule at all times. • Behave in a polite and courteous manner at all times. • Behave in a responsible and safe manner at all times. Please ensure your child has the correct uniform and their student ID lanyard with them. • Show respect towards their fellow students, teachers and support staff. • Show respect for their property, that of the school and that of their fellow students. Vandals will pay for their damage, and theft will be dealt with in a very serious manner. • Wear their uniform when attending Parents Evening. • Sign a Student Contract outlining the School Expectation and Code of Conduct. • Visit lockers and prepare books for Periods 1 and 2. • Wait outside until the bell rings. • Visit the library for silent study. • Once in school, students must not leave the premises unless collected by a parent. • Tutor rooms are out of bounds until the bell rings. • Students should wait outside the tutor rooms in a quiet and orderly manner, with their Student Planner out of their bags, until given permission to enter. • Students should wait outside the classroom until given permission to enter the room by the subject teacher. • They should enter the lesson with their Student Planner and their student ID lanyard both clearly visible to the teaching staff. • Once inside the classroom they should begin preparation to learn quickly and quietly and stow their bags and belongings safely. • At the end of a lesson they should wait for the teacher to dismiss them, leaving the room tidy with chairs and stools placed under the desk/table. • Visit lockers at the beginning or end of break. • All students should be outside within 5 minutes of the bell ringing. • All food and drink (except for water) is to be consumed outside. • Treat the bathrooms and all school facilities with care and take pride in keeping them tidy. • Visit lockers at the beginning or end of lunch time. • Students are allowed in the school buildings to attend published activities or to sit in allocated ‘chat rooms’ or work rooms; otherwise they should be in the playground or on the school field, unless it is declared a ‘wet break’ where all students will be allowed into their own form rooms only. • Students should not wander about inside the school. 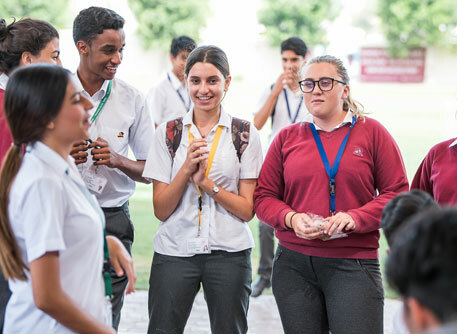 • Students, except for the Sixth Form, are not permitted to leave the school by the main entrance but should use the two exits near the computer room and the toilets. • Students should leave the grounds taking extra care and cross only at the crossing with the Security Guard. • Students should not remain on school grounds unless they have an activity to attend. • Parents are asked to arrange pick-up at 3:15pm as students will not be supervised after this time. • Students should not be routinely left waiting for collection after 3.30pm.